Through the hard work of volunteers from across the country,Â Â we continue to rehab dozens of flooded homes in our community. At the same time we have built or begun building several new houses from the ground up. 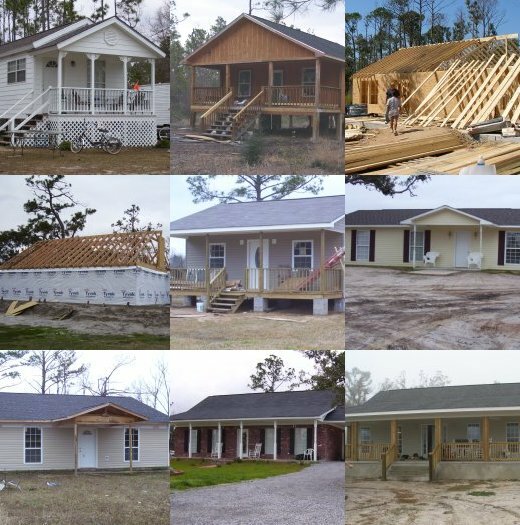 The nine families or individuals who will soon occupy these houses pictured above lost their homes to Katrina. We constructed seven of these new houses with 100% volunteer labor. The last two (bottom right) homeowners were able to contract some of the work with hired labor. Four out of the nine have moved in and the others still need work. We plan to begin several more new construction projects in the coming weeks. Contact us to make plans for you or your group to come help with finishing these projects.